How to preview the videos when add the watermarks, and how to convert them into the format we want? Why we need to convert watermarked videos into those popular formats? The social networks have been changing our lifestyle, and it brought us a lot of fun and joy to share our videos online.We often download videos from the popular social networks such as Facebook, YouTube, and play them on the other media devices, or to convert our own videos into suitable format to upload and share them with friends. So it may become an important step to watermark videos and convert them into the formats permitted. Just like watermark YouTube and watermark facebook. At present, the most popular video formats are MKV, AVI, MP4 etc., and they all supported by those social networks. That’ one reason why we have to convert the watermarked videos into other formats. However there are few tools which are able to, not to mention the complicated operations. 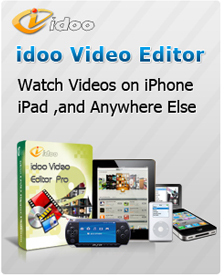 idoo Video Editor is an easy-to-use and powerful software who can solve your problems with ease. We often preview the outcome when we add watermarks to videos, and then to modify and improve them. Obviously the preview function makes great sense. By idoo Video Editor, you may preview the videos at any stage of editing job, and you may also capture the screen whenever you want and save the picture as different file types. 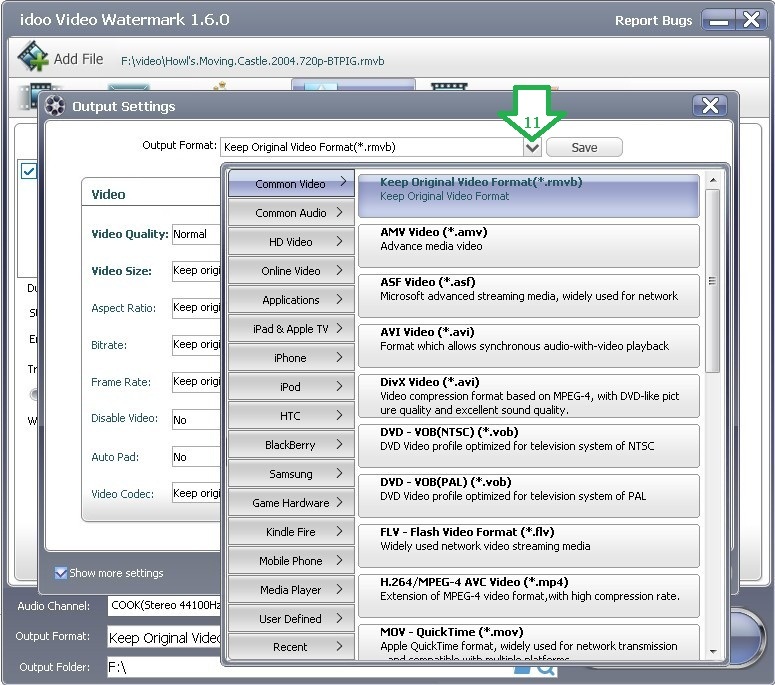 The watermark function of idoo Video Editor integrated other functions just like preview, format conversion, and presents the easy operation to you in a clear interface. So, it’s your best choice of YouTube watermark/ facebook watermark/ MKV watermark/ MP4 watermark/ AVI watermark maker. 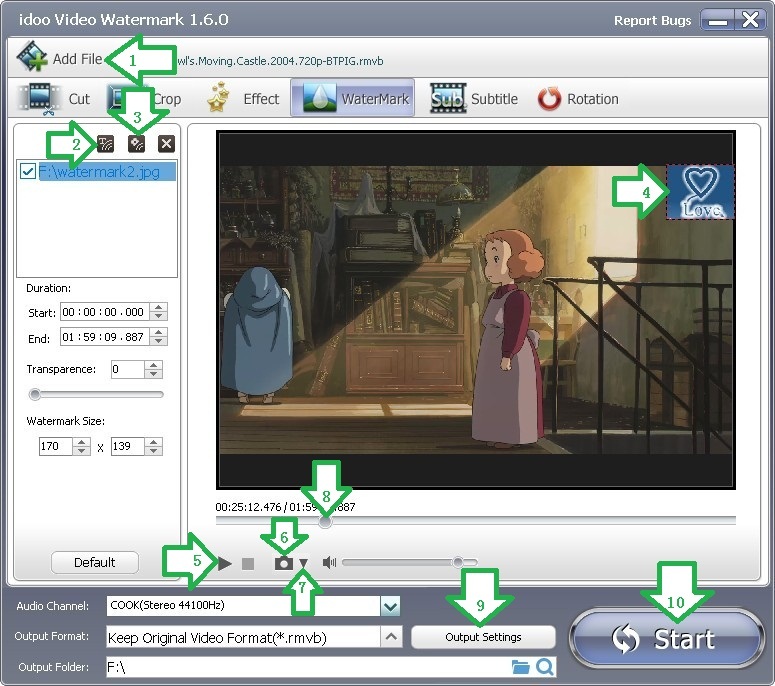 The following part will show you how to preview and convert the video when add watermarks to it. 2. You may add text watermark (Arrow2) or picture watermark (Arrow3) . 3. The picture watermark is shown in the right preview box (Arrow4), and you may add special effects to it. 4. Click Arrow5 to play and preview the video. 5. Click Arrow6 to capture the screen, and click Arrow7 to open the photo folder or to select the picture format. 6. You may also preview the video by dragging the time slider (Arrow8). 7. Then click “Output Settings” (Arrow9). 8. In the dialog box of “Output Settings”, click the drag-down list (Arrow11) to select the format you want. 9. Confirm and return to last menu, and click “Start” (Arrow10) to begin editing. Then to check the output file or edit it.